As I’m about to go to bed on this 9th of May, I’m reviewing these last incredible 24 hours. I entered this place a few hours ago, still staggering from the fury which had seized me all day long. I had needed 2 hours and over 60km to get free of the rage, genuine shrieking fury, pointless but so powerful that I could not have gotten rid of it by any other means. I had not found anyone earlier that day to give me a lift, more precisely, I could not comprehend why it was taking me so long to get to Mendoza. 120minutes to refocus myself, get aligned again with my being, get in sync with the Everything and hear the voice of Providence loud and clear. All of the world meditations wouldn’t have provided positive effects of this relentless cavalcade, crazy and crazed because it was the only possible reconciliation. One has to reply to the body screams in its own language, when the blood rushes, it’s viscerally physical, so must be the reaction. Exhausted, I had entered the place to ask for water, to make me stay, one had to insist: I could not see it directly at that time, but I had no other choice: it’s getting dark really fast in Fall into the Argentinian Pampa and there is no place for improvisation. When the skies are burning, you have only half an hour left of low light. They were feeding the animals, and finishing shoeing the horse for the Sunday short track race. They were about to take the mate (Argentinian infused drink) to celebrate the end of the working day, and the kid (young goat) was waiting his turn to be put into the kiln. The garish light of the ceiling started flicking as I was passing the kitchen door: a few minutes before, one had turned on the power generator and it need time to find its idle mode. The solar panels on the rooftop will take over tomorrow. The cat is chasing the domesticated hare for a piece of bread, the chimney fire is heating up the multiple drafts in the room and the satellite is searching its frequency to feed the television that will roar the entire evening. The harsh white light does not leave place to nuances and the wall covering is falling into pieces. 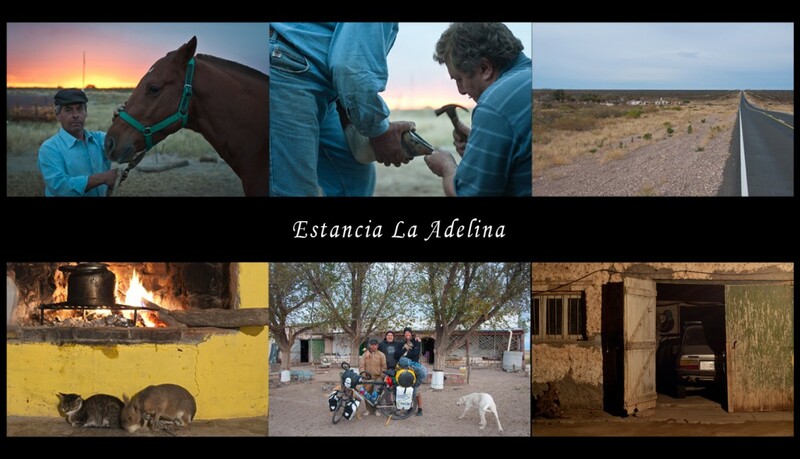 I’m in an Estancia, The Adelina, and my hosts are Gauchos. More than words, it’s an atmosphere, indescribable but palpable: one can guess the men sweating as sure as one can see the long knife on their belt. We chat a bit, not too much of course, about my travel plans and the best and worst sides of Argentina. « I only left one place unvisited on the territory, willingly, and keep it like this for when I’ll be old ». This sentence, more than any other will make me understand that they’ve got Argentina under their skin, that Argentina, it’s them. I recall this moment, when, sharing my fear from the cars and trucks whooshing by, their answer felt simply, naturally, without any other form: « I’ve never been scared, I don’t know what it is ». I will take a shower under a thin trickle of tepid water, improving without any doubt my last consumption record. We’ll end up the evening with a glass of Geneva, to celebrate the victory of La Boca Soccer team, one glass only, no more. In this place, nothing is bleak but there is no place for the unnecessary. We’ll walk outside for a few minutes, watching the stars with the drone of the power generator that shares the garage with an antique Renault 12. We’ll close the day around midnight, cows, horses and goats are already asleep and only a few late arrivals are rushing to get back home on the road. They have at least another hour drive in front of them, provided that they live in the next village. I spent one of my most restorative nights here, I guess that the self-confidence and certainty that emanate from these men contains something contagious. Naively, I asked one of them to sign something into my diary… met with a short shake of the head… nothing personal, just to signify that things are well the way they are. The art of communication sometimes can do without words to make it even clearer…paradoxically. As we were taking leave of each other, it’s a calloused handshake or a manly embrace depending on the sensibility, but always a sustained, fixed gaze, proud but so terribly human that goes with these last moments. Life in the Pampa does not care about 3 men who are waving goodbye. They are not yogis, nor scholars, barely would they write their name with a capital letter, but some men on the Planet have already found the peace. I see that the reports have taken a “literature” cut. Chatwin’s direction, if I am not mistaken. Not bad what I read, I would say. It should be considered that I am an engineer. As a result my statement above is basically groundless. It could be bad and I wouldn’t know. .. a note about the math. It is proven that 60 Km takes 2 hours. It’s in the report. Which would imply 200 hours or 20 days. Uhmm, I need to reconcile the number.